How tight should I screw in the spring screws on the mounting kit? When screwing in the spring screws continue until you feel a clear stop, and do not go any further. Minimum force should be needed when installing your CRYORIG heatsink. When I try to screw on the Spring Screws, I find it difficult to screw the other side once I'm finished with the first. What am I doing wrong? When screwing the Spring Screws please screw in 1/3rd’s at a time then alternate between both sides. Totally screwing in one side directly may cause harm to the spring screws and make it difficult to screw the heatsink properly. When installing my C1, I am having difficulties to screw on the spring screws onto the mounting bar, any tips? When placing the C1 onto the CPU, first make sure that the spring screws are in fact inserted into the elevated screw holes on the mounting bar. Next, when sliding down the screw driver place the screw driver into the mounting hole. Slightly tilt the head of the screw driver towards the back of the heatsink if you’re having problems locating the spring screw head. Can I use other fans on the C1? What types of fans are supported? Yes, with the provided screws, users are able to put a standard 120mm square fan or 140mm round fan. When I install the Backplate onto my mainboard, I notice that the Backplate and Screw Pillars are hanging lose from the mainboard and it is impossible to screw the Screw Pillars all the way down, is this right? Just like how we mentioned on the Installation Guide, the Screw Pillars are meant to hang and not contact the mainboard. This is actually part of Intel’s and AMD’s design guideline for CPU heatsinks. By leaving space, allows the C1 and the Backplate to sandwich and apply even pressure to the top of the CPU and the back of the socket. 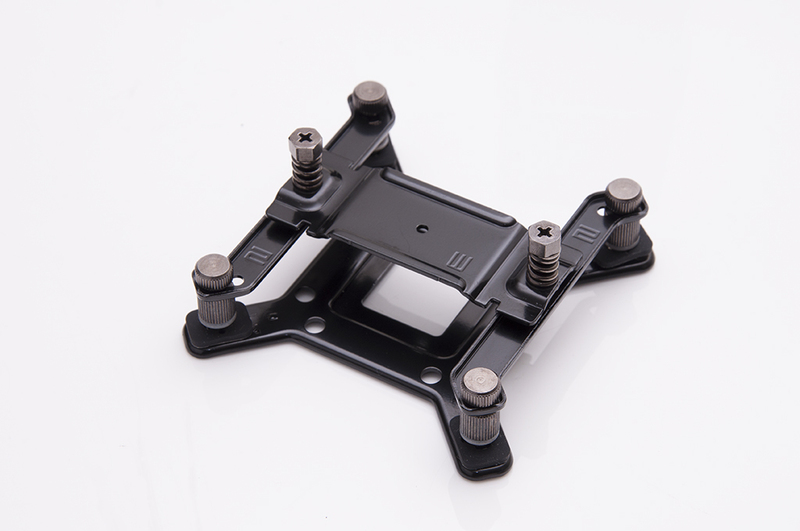 This means that the Backplate is correctly doing its job in providing pressure and support for the mainboard, and preventing it from bending. Actually if it were the four Screw Pillars touching and clamping onto the mainboard, then the heatsink would actually be pulling on the mainboard on four individual points rather than a plane. This actually is counterproductive, and not actually putting the backplate to use.